CARBONDALE, Ill. — With a variety of activities available for children, there is always something happening at Rainbow’s End Child Development Center at Southern Illinois University Carbondale. The center provides licensed child care for children from the age of six weeks through second grade. Located at 650 S. State St., behind SIU’s Student Health Center, the center operates from 7:30 a.m. to 5:30 p.m. Monday through Friday. There are now openings at the center for children ages 1 to 5 years old, and afterschool care for school-age children. Also, preparations are underway for “Professions – What Kids Want to be When they Grow Up” — the school-age summer program for children in kindergarten through second grade. “We try to make each event unique and fun for the kids while hands-on learning is being implemented,” McCann said. Children participate in a variety of educational activities at the center under the direction of skilled and experienced teaching staff, assisted by early childhood education students from the university. Among the program offerings is “Stretch-n-Grow,” a fitness, nutrition and wellness program for kids ages 2 years old and up. The weekly sessions last 30 minutes for each class. Children participate in classes that include exercise, activities and discussions on health and related issues such as nutrition, hygiene and safety. The center partners with the university’s Behavior Analysis Therapy program run by Erica Jowett Hirst, an assistant professor in the Rehabilitation Institute’s Child Behavior Research and Training Lab. Hirst’s students come to classrooms to observe and suggest strategies to help with classroom management. They also work one-on-one with select children to provide early intervention and additional behavioral support. Preference is given to children of SIU students, faculty and staff as enrollment in an age group fills up. The cost varies depending on the child’s age and also whether the parent is a student, faculty/staff member or from the community. Breakfast, lunch and an afternoon snack are provided. The center is licensed by the Illinois Department of Children and Family Services. In addition to numerous classrooms, there is an indoor activity room and three playgrounds. The center has a low child-to-teacher ratio and participates in the Illinois Department of Human Services Child Care Subsidy Program. The center is holding a fundraiser next week to help buy classroom materials and summer playground equipment. 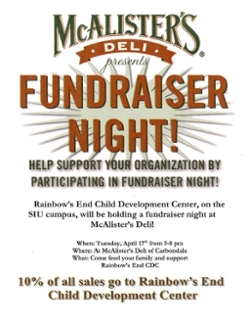 A fundraiser night is from 5 to 8 p.m., April 17, at McAlister’s Deli of Carbondale, 1382 E. Main St., Carbondale. Ten percent of all sales during those three hours will go to the center. To learn more about Rainbow’s End Child Development Center, visit rainbowsend.siu.edu or visit the center and take a tour. You can also find out more or register a child by calling 618/453-6358. 1382 E. Main St., Carbondale. 10 percent of all sales during those three hours will go to the center for classroom and playground equipment.